1. How did you first get into sailing? 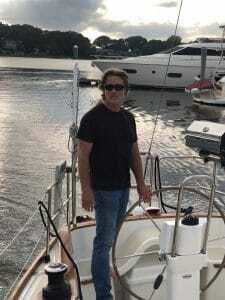 I was in my mid 20’s when my parents invited me on a day sail aboard a chartered, wooden, 72’ schooner out of Camden Maine. The captain shared many stories of sailing the Caribbean Sea aboard that boat with his wife and kids. I knew from that very moment, sailing and exploring the world was my future. Within six months from that day aboard the schooner, I bought a boat and dove into the cruising lifestyle headfirst. After few years of hard work and lots of reading, my young family was sailing the Bahamas and New England waters. 2. Have you had any disaster scenarios, failures, or simple problems in your sailing career that have given you a valuable lesson as a result? Boat issues are part of the lifestyle; like it or not. I’ve encountered issues with my own boats and have delivered all kinds of boats up and down the coast. I’ve had to work through many difficult situations and near disasters including numerous engine failures, shafts that separate from the transmission, seized engines, hotel systems breaking and flooding situations. The most important thing that I’ve learned from these adventures is to stay calm no matter how bad things look. Boat issues have educated me to become a better sailor by preventing would be troubles through good maintenance practices. 3. If there’s one thing you can tell new sailors when they are just introduced to the sport, what would you tell them? Don’t hold yourself back over fear or lack of the skills that you wished you already had. Take what you know and get out there and build new skills. Read, surf YouTube and talk with sailors who are more experienced. Sailing is for life – you will always be learning and discovering new ways of doing things around boats. 4. What advice would you tell a new sailor to ignore? What are bad recommendations you hear about sailing? “A boat is a hole in the water that you throw thousand dollar bills into”. Yes, boating can be expensive if you choose. There are so many inexpensive boats available, that with a bit of hard work, will take you anywhere. New sailors are sometimes told to start small and work their way into bigger boats as they grow with experience. This may be the right advice for the casual sailor with no offshore aspirations. If you know that long distance sailing is for you then don’t waste valuable time and money on that “someday boat”. Go for it. Find your dream boat and fast-track your way into sailing by taking ASA courses like ASA 118: Advanced Docking. From my experience, docking is the number one reason new sailors fear being in command of larger boats. ASA instructors will provide the building blocks for you to become proficient at docking, boat handling, navigation and much more. You have the rest of your life to build on these skills. 5. Who most influenced your life when it comes to sailing? There were many sailor/authors who influenced me. Lin and Larry Pardey were a huge influence on me, having met them several times. Don Casey and Nigel Calder have taught me many skills through their writing. Today, a few YouTube channels, sailing blogs and other web sources inspire me. 6. Outside of sailing, what is something that you love to do; something that makes you feel alive? Sailing is my life. When I’m not on the water, I really enjoy designing and fabricating things in my shop to be used on my boat – anything from woodworking to sewing canvas. Ron lived aboard his boat home schooling his kids and sailing around the Caribbean for several years. Hugely experienced and mild mannered; he owns a 47′ cruising boat. Mostly Ron is simply a good teacher using a “coach like” style that produces good sailors! Want to learn about our other instructors, special events, and sailing tips? Simply sign up below.